injuries – during the weekly Friday protests that began on 30 March. In a petition requesting that the Israeli Supreme Court order the Israeli army to stop using live ammunition to disperse protests, human rights groups Adalah and Al Mezan provided evidence of 12 videos [PDF] published on social media showing unarmed protesters, including women and children, being shot by the Israeli army. In some cases, people were shot while waving the Palestinian flag or running away from the fence. DIMITRI LASCARIS: This is Dimitri Lascaris, reporting for The Real News Network from Montreal, Canada. 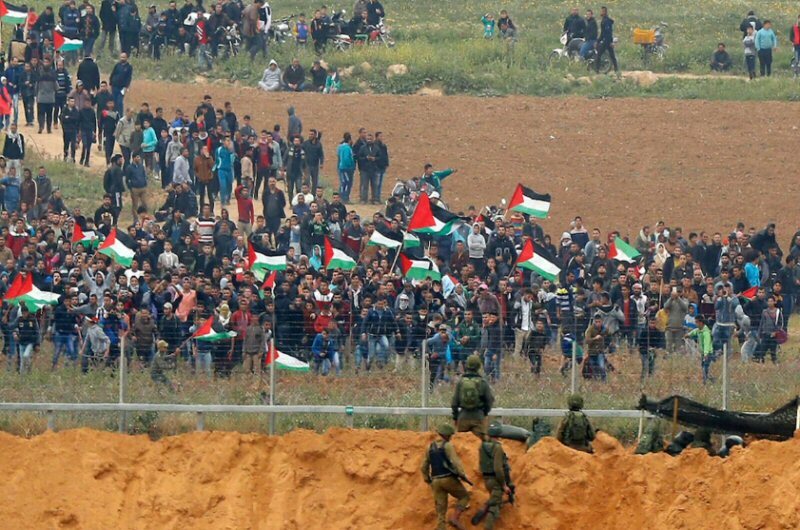 On March 30th, the day that is known to Palestinians as Land Day, thousands of protesters in the blockaded and heavily populated enclave of Gaza began a series of peaceful protests, known as The Great March of the Return. These protests are intended to culminate on May 15th, which is known to Palestinians as the Nakba Day, or the Day of Catastrophe. Nakba Day is a commemoration of the expulsion from Palestine in 1948 of an estimated seven hundred thousand Palestinians, and the destruction and depopulation, by Zionist forces, of hundreds of Palestinian towns and villages. During this year’s Great March of the Return, Israeli snipers have killed dozens of Palestinian protesters, and wounded hundreds of others. As the Nakba Day approaches, there seems to be no relaxation by the Israeli military in its brutal response to these protests.Now, here to discuss with us what is happening on the ground are two representatives of Al-Haq, a human rights organization founded in 1979, and based in the occupied Palestinian territories. Rania Muhareb is a legal researcher with the Palestinian human rights organization, Al-Haq. She holds an LLM in International Human Rights and Humanitarian Law. She joins us today from Ramallah, in the occupied West Bank. Tareq Zaqoot has worked with Al-Haq as a field researcher in the Gaza Strip since 2008. Over the past 10 years, Tareq has monitored and documented human rights violations perpetrated by both Israel and the Palestinian Authority, and he has covered and documented three Israeli offensives against Gaza. He joins us today from Gaza itself. Thank you very much for coming on the real news, Rania and Tareq. TAREQ ZAQOOT: Okay. March 30th, 2018 is a national commemoration for Palestinians, in which they mark Land Day. That day, the peaceful march began, tens of thousands, all age groups, including children, women, and entire families, located within the Palestinian territory in entirely open areas, close to the border fence. These protests emerged in a spontaneous manner through popular mobilization. How did we get here? The enclosure of the Gaza Strip, eleven years of blockade, and a number of successive crises. The protest leaders former the High National Commission for Great Return March and for Ending the Blockade. The title of the march is clear, and as announced by the Commission and the protesters, it will continue until May 15th, which is another commemoration day that will mark the seventieth anniversary of the Palestinian Nakba. The protesters want to express their demands, their will, and right of return, in line with United Nations Resolution 194. They consider this their inalienable right, which as of now is yet to be realized.As such, the protests were overall peaceful. We did not observe any armed presence within the protests. As well, the protesters posed no threat whatsoever to the Israeli occupying soldiers. 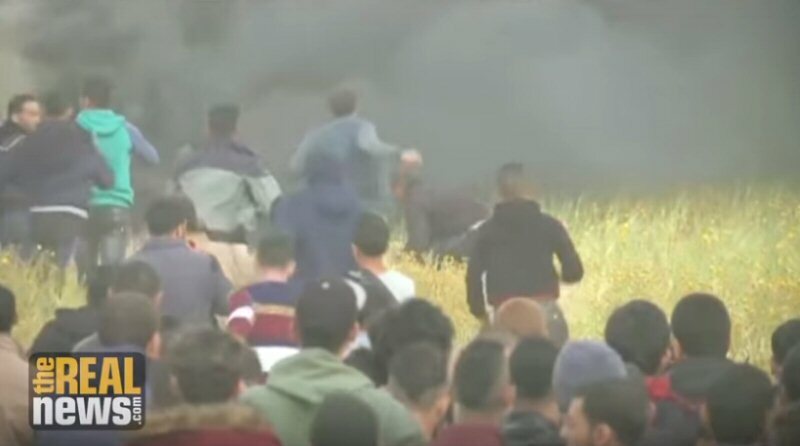 They were peacefully protesting, some waving the Palestinian flag, others chanting national slogans, while some were burning tires in areas close to the border fence. Tens of protesters tried to approach the barbed wire to hang the Palestinian flag on it or to cut pieces of it. When we talk about the barbed wire, it must be noted that there is a main border fence thirty meters from the barbed wire, with Israeli soldiers positioned behind elevated sand hills at least fifty meters within the main border fence. This means there is a large distance between the protesters and the Israeli occupying forces. RANIA MUHAREB: As you know, these are peaceful protests, as my colleague has just confirmed. They are peaceful protests of civilians, and even if there are members of Hamas within the protest, the fact of them being unarmed offers them protection under international law. And Israel, as the occupying power, in the policing of a peaceful assembly, such as The Great March of Return, must be guided by the principles of necessity and proportionality in the use of lethal force. This means that the occupying forces may only use lethal force when absolutely necessary, in order to protect life. And this is clearly not the situation that we’re talking about here. And the evidence of this is that the International Criminal Court even came out and said, Israel may be committing war crimes in targeting peaceful civilian protesters in the Gaza Strip. And this is exactly what we are documenting, as well, at Al-Haq. We are documenting excessive use of force, but not only excessive, also premeditated and intentional use of force. This means that there is an actual order given to Israeli soldiers to use the force that we have document. And we see this in the casualties and the types and nature of injuries that my colleagues are discussing and are documenting on the ground. If I can quote one Israeli official, on the types of orders given to the Israeli occupying forces, and the soldiers that are positioned at the fence- you may know a few days ago on 21st of April, an Israeli brigadier general and former head of the Southern Command of the Israeli occupation forces, discussed in a radio interview how such commands are given. And I quote, he says, “I know how these orders are given, I know how a sniper does the shooting, I know how many authorizations he needs before he receives an authorization to open fire. It is not the whim of one or the other sniper who identifies the small body of a child now, and decides he’ll shoot. Someone marks the target for him very well and tells me exactly why one has to shoot, and what the threat is from that individual. And to my great sorrow, sometimes when you shoot at the small body and you intend to hit his arm or shoulder, it goes even higher.” So, this is just to show that we are dealing with premeditated, intentional use of force, and a shoot to kill policy that we at Al-Haq have been documenting for decades. Which means that Israel’s response to the Great March of Return is none other than intentional commission of willful killings and war crimes, and has nothing to do with the nature of the assembly itself. DIMITRI LASCARIS: So, Al-Haq and partner nations in Gaza, including the Palestinian Center for Human Rights and Al Mezan, have made a submission to the International Criminal Court indicating the names of the victims and the killings that have been perpetrated by the Israeli occupying forces since the 30th of March. We’ve not only indicated the names of those killed, we’ve also indicated an intention to use- an intention to kill, and to shoot to kill Palestinian protesters, which may constitute a war crime of willful killing.We’ve also discussed the injuries that we are documenting, which may amount to the war crime of willfully causing great injury and suffering to civilians. So, this submission has been made to the International Criminal Court on behalf of Palestinian human rights organizations, and we have urged, in the submission, we urged the prosecutor to immediately request the opening of an investigation into the situation. As you know, the ICC is currently conducting a preliminary examination into alleged war crimes and crimes against humanity being committed. And we hope that, considering the ongoing nature of these crimes, the ICC will take action. But we also urge, of course, third states to impose sanctions on Israel for its continued commission of crimes and grave breaches of the Geneva Conventions. The Palestinian Center for Development and Media Freedoms (MADA) has called for the formation of an independent commission of inquiry, into the killing of Palestinian journalists Ahmed Abu Hussein and Yasser Murtaja, during field coverage of the Return Marches along the borders of Gaza Strip. 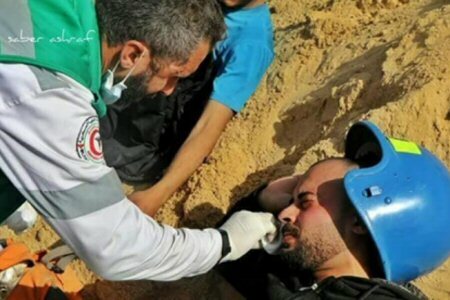 Journalist Ahmad Abu Hussein, 25 years old, died on Wednesday after being targeted with an explosive ammunition bullet, fired by Israeli snipers, while covering the “Return March”, east of Jabalia, in the Gaza Strip, 19 days following the killing of Yaser Murtaja (31years), who was also targeted by an Israeli occupation sniper. MADA center documented at least 12 journalists targeted with live ammunition by Israeli snipers in the Gaza Strip; a grave breach of the fourth Geneva Convention, since the start of the march 30/03/2018, until the evening of 24/4/2018. Ahmed Abu Hussein, a journalist at the “Sawt Al Sha’b” the Voice of the People radio station in Gaza, was wounded on 13/4/2018. A member of the General Secretariat of the Journalists Syndicate and a colleague of the journalist Abu Hussein in “Sawt Al Sha’b” Voice of the People, journalist Rami Al-Sharafi reported to MADA Center that journalist Abu Hussein, at 2:30 pm on 13/4/2018, was covering the peaceful demonstration hundreds of meters away from the border fence in East Jabalia,. He was identifiable with the “PRESS” vest. He was targeted by Israeli forces with an explosive live bullet, just below the press vest, which penetrated his left abdomen. He was immediately transferred to the Indonesian hospital, north of Gaza, where he underwent a surgery that lasted 3 and a half hours, in which one kidney, the spleen and part of the pancreas were removed in order to save his life. He was diagnosed with acute bleeding related to aortic artery. The next day, procedures were started to obtain a permit for him, to be transferred for treatment in Ramallah. He was actually transferred on Monday 16/4, to the Ramallah Medical Complex, where it was found found that he was suffering from toxemia. He underwent another surgery and his health improved until Thursday 18/04, when his health status deteriorated. He was then transferred to the Israeli Hospital Tel Hashomer, were they discovered he has a brain damage that led to Ahmed’s coma, until about 4:15 pm on Wednesday, 25/4, where he was pronounced dead. The killing of journalist Ahmed Abu Hussein the total number of journalists killed by the Israeli occupation forces to 43, since the beginning of 2000, in the West Bank and Gaza Strip. The information provided by MADA was based on various data available through a monitoring and documentation unit, regarding the killing of journalists Ahmad Abu Hussein and Yasser Murtaja, and the wounding of 12 other journalists with live ammunition (causing severe injuries, some of the injuries left lifetime physical effects on journalists). this in addition to doubled numbers of partial injuries among journalists. However, PNN further reports, the culture of impunity enjoyed by the Israeli occupation, and the ongoing target of journalists that goes without accountability, encourage Israeli soldiers to continue to commit these crimes at a fast pace. Therefore, MADA center calls for the formation of an independent commission of inquiry into all these crimes, particularly the killing of journalists, and calls on all international communities to put pressure on Israel, to take real action in demanding the prosecution of perpetrators, and to put an end to acts of impunity that are an incentive for the Israeli army to carry out its flagrant attacks against journalists and against media freedoms in Palestine. In the photo, the journalist Ahmed Abu Hussein after being targeted by Israeli Occupation Snipers in the field (By Photographer Saber Ashraf). Israel has repeatedly denied Palestinians permits to build schools in the West Bank and demolished schools built without permits, making it more difficult or impossible for thousands of children to get an education, Human Rights Watch (HRW) reported on Wednesday. According to HRW, on April 25, 2018, Israel’s high court will hold what may be the final hearing on the military’s plans to demolish a school in Khan al-Ahmar Abu al-Hilu, a Palestinian community. It is one of the 44 Palestinian schools at risk of full or partial demolition because Israeli authorities say they were built illegally. The Israeli military refuses to permit most new Palestinian construction in the 60 percent of the West Bank where it has exclusive control over planning and building, even as the military facilitates settler construction. The military has enforced this discriminatory system by razing thousands of Palestinian properties, including schools, creating pressure on Palestinians to leave their communities. When Israeli authorities have demolished schools, they have not taken steps to ensure that children in the area have access to schools of at least the same quality. Israeli military authorities have demolished or confiscated Palestinian school buildings or property in the West Bank at least 16 times since 2010, with 12 incidents since 2016, repeatedly targeting some schools, Human Rights Watch found. Over a third of Palestinian communities in Area C, the 60 percent of the West Bank where the Israeli military has exclusive control over building under the 1993 Oslo accords, currently do not have primary schools, and 10,000 children attend school in tents, shacks, or other structures without heating or air-conditioning, according to the UN. About 1,700 children had to walk five or more kilometers to school due to road closures, lack of passable roads or transportation, or other problems, according to 2015 UN estimates. The long distances and fear of harassment by settlers or the military lead some parents to take their children out of school, with a disproportionate impact on girls. 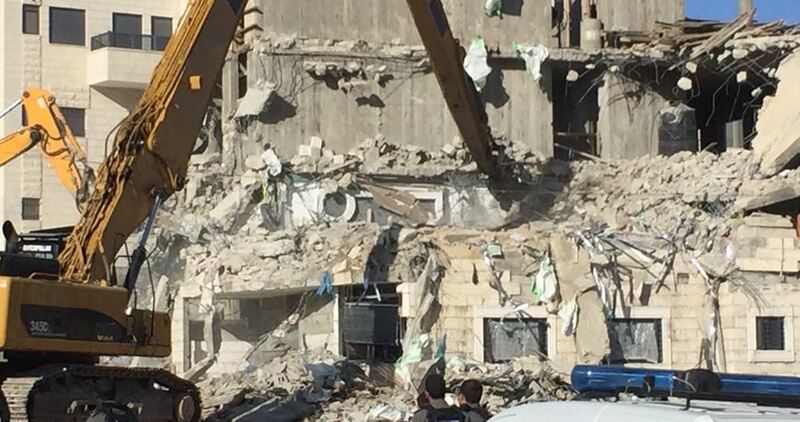 Most West Bank schools at risk of demolition fall within Area C. Israel justifies its demolition of schools and other Palestinian property there not on security grounds, but rather on the grounds that they were built without permits from the military. However, the military refuses the vast majority of Palestinian building requests, and has zoned only 1 percent of Area C for Palestinian building, even as construction proceeds with few constraints in nearby Israeli settlements. The school demolitions are consistent with other actions that make communities unviable, such as home demolitions, and the refusal to zone the communities or grant them connections to utilities like water and electricity, Human Rights Watch said. Since Prime Minister Benjamin Netanyahu took office on March 31, 2009, Israeli forces have demolished 5,351 Palestinian buildings in the West Bank for lack of building permits, including East Jerusalem, displacing 7,988 people, including more than 4,100 children, based on UN data. Israel has not offered resettlement options or compensation to families whose homes were demolished during this period. Israel’s destruction of Palestinian schools, and its failure to replace them, violates its obligation as an occupying power to “facilitate the proper working of all institutions devoted to the care and education of children,” and violates the prohibition on interfering with the activities of educational institutions or requisitioning their property. International law prohibits an occupying power from destroying property, including schools, unless “absolutely necessary” for “military operations.” The Fourth Geneva Convention and the Rome Statute of the International Criminal Court prohibit widespread, unlawful destruction of property as a war crime.